In school I remember a teacher asking us to draw a picture of what we wanted to be when we grew up. I told her I wanted to be a mom and she said I needed to pick something else. 🤔 I was always upset by that, thinking that was my dream – why do I have to choose something else? I don’t know if it were her intentions or not but I’m hoping she was telling me that I could be a Mom AND something else. It took me a few years to figure it out but I’ve found that something else that I’m passionate about. I’m a Mom encouraging and empowering other Mom’s to take control of their mindset, their health and their lives. It’s taken sometime for me to get to this point but I get it now. 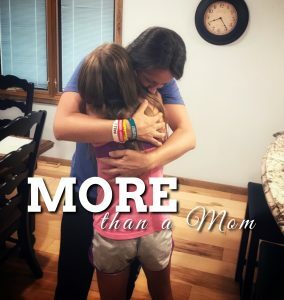 I can be more than a Mom. I can love and serve my family, always keeping them first AND empower other people to live a life of passion and purpose. I can give my attention to something else without taking away from my family. I can have a passion outside of the passionate love I have for my family. I can spend a few hours or even days away from home pursuing my passion without regret. Balance doesn’t always mean equal time on family and work each day. To me balance is keeping each cup full. What does that look like? Giving my full attention to my business and coaches the last few days and then giving my family my FULL attention now that I’m home. They say to ask yourself the question: What would you do with your time if you didn’t HAVE to do anything? And that’s meant to be what you should pick for a career. I’m literally doing it.